The Miami Trace Lady Panthers volleyball team began play in the new Frontier Athletic Conference with a home match against Chillicothe Tuesday, Aug. 29. 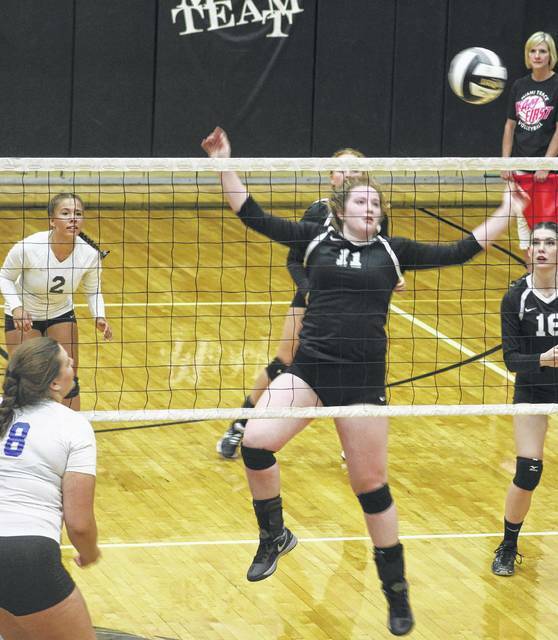 Chillicothe won the match in straight sets, 25-7, 25-17 and 25-11. Miami Trace will be back in action Thursday at McClain High School against the Lady Tigers. Miami Trace’s Erica Marshall (11) hits the ball back over the net during a Frontier Athletic Conference match against Chillicothe Tuesday, Aug. 29, 2017. Also pictured for Miami Trace are Dyamin Baker (2) and Taylor Dawson (16). https://www.recordherald.com/wp-content/uploads/sites/27/2017/08/web1_MT-vball-Erica-Marshall-vs-Chillicothe-8-29-2017.jpgMiami Trace’s Erica Marshall (11) hits the ball back over the net during a Frontier Athletic Conference match against Chillicothe Tuesday, Aug. 29, 2017. Also pictured for Miami Trace are Dyamin Baker (2) and Taylor Dawson (16).